The headline reads “Occupying children’s minds: ‘Radical children’s literature at Wall Street protests. 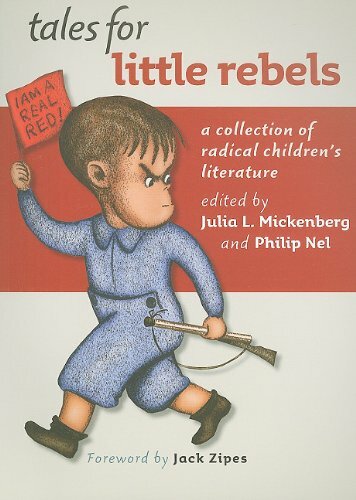 '” Featured prominently is Julia Mickenberg’s and my Tales for Little Rebels. After reading the piece (though, not, I suspect, the book itself), one commenter, writing under the name of “forcerecon2,” worrries that Tales for Little Rebels represents “the indoctrination of our children.” Coming from the left but also opposing indoctrination, Occupy Wall Street organizer Kelley Wolcott writes in response to the suggestion that children of OWS protesters read Tales for Little Rebels: “I think that we should provide teaching related services that DO NOT have an agenda, and treat children in a respectful way that allows them to explore their own ideas about what is fair or not fair without imposing an adult agenda.” Though the stories contained in the book are more sympathetic to Wolcott’s point of view than to forcerecon2’s, both statements convey only a partial understand how literature works. All children’s literature is political — from Dr. Seuss to The Poky Little Puppy to Left Behind: The Kids. All stories bear the influence of the world in which they were produced; some display that influence more prominently, and others more successfully mask ideological assumptions. There are no stories “that DO NOT have an agenda.” Yet, if children’s literature serves a socializing function, predicting its effectiveness on children is a tricky business. Child readers might embrace the message, or resist it, or … even forget all about it. It’s true that Tales for Little Rebels does include some stories written by people who wished young readers to adopt a very specific, often quite sectarian, view of the world. Caroline Nelson’s “Nature Talks on Economics” — one of the stories that inspired the coverage on The Daily Caller and Fox Nation — does harbor such aspirations. In that tale, revolutionary chick cries, “Strike down the wall!” and liberates itself from the “egg state.” A lesson about nature becomes a metaphor for revolution. However, in and of itself, this story provides little evidence that Tales for Little Rebels is a tool of indoctrination. First, it’s but one of 44 stories on subjects ranging from peace to the dignity of work, from the power of the imagination to opposing bigotry, from environmental protection to finding strength in organizing — stories that would be quite apropos to the OWS protesters, incidentally. It would be truly remarkable for one story to manage to indoctrinate those who read it. Taken in context with other literature or read in a socialist family (as “Nature Talks on Economics” very likely was done, originally), it stands a stronger chance — but only if the child hearing the story identified with the values of his or her parents. Which brings me to my second point: children are not passive beings, empty receptacles which people can fill with ideas. They’re certainly affected by the culture in which they live, but they’re also capable of thinking for themselves. Indeed, we hope that some of the stories in Tales for Little Rebels nurture that kind of critical thinking — Ruth Benedict and Gene Weltfish’s The Races of Mankind, which uses science to challenge racism, or Oscar the Ostrich, in which the birds defeat a would-be fascist by taking their heads out of the sand, and speaking out against him. Though, of course, children may fail to get these messages. Tales for Little Rebels includes a scene from Revolt of the Beavers, a play in which beavers liberate Beaverland from a tyrant, and redistribute the wealth. When an NYU Professor of Psychology interviewed hundreds of child audience members about lessons the play imparted, they told him they learned things like “never to be selfish,” and “beavers have manners just like children.” Not exactly what (I imagine) the play intended to teach. Tales for Little Rebels contains a range of opinions from people on the twentieth-century left. Though Julia and I expected that most of the stories would resonate with contemporary progressives, we also deliberately included some stories that would not (notably “ABC for Martin,” which we nicknamed “the Communist ABC”). We didn’t want to whitewash history by excising stories that may be embarrassing to those on the left — so, those stories are in the book, too. But they’re in there along with introductory material that invites readers to think critically about them. We didn’t create the book hoping that it would encourage everyone to adopt a particular “party line.” Rather, we hoped that it would encourage readers of all ages to think, to ask questions, and to understand that the world in which they live is not a given. People can change it. They can change it. 1. Philip Pullman, “Intention,” Keywords for Children’s Literature, ed. Philip Nel and Lissa Paul (New York University Press, 2011). Radical Children’s Literature Now! (handout) (25 Jun. 2011). This also includes relevant awards and other resources. Nice response. It can be fairly intimidating when these right wing zealots aggressively attack. The best response is to logically respond as you have done. Great post! I am assigning it to my “Children and Culture” class to read next week! We’ve been talking a lot about the idea that no children’s text is ideologically innocent (as well as not taking authorial intent too seriously). Can you say a little more here in the comments section about a children’s text that seems apolitical, yet really isn’t (like a Dr. Seuss book)? Or give us a link to another post that makes that point? Marah: Sure thing! Janette Sebring Lowrey and Gustaf Tenggren’s The Poky Little Puppy (1942) — one of the best-selling children’s books of all time — might be read as a coercive text, sending a message that children should be obedient. For digging under the fence, the title character is (at book’s end) denied dessert. It’s a classic example of an animal standing in for a child character; the disciplining of the animal stands in for the disciplining of the child (via the withholding of dessert). The book is in my office, and I am not — so, that’s as much detail as I can summon here. We might also argue that Jeanne Birdsall’s National Book Award-winning The Penderwicks (2005) naturalizes class difference by making invisible the maintenance of class structures, and by suggesting that Mrs. Tifton’s imperial attitude derives not from her upper-class status but from unacknowledged anger towards her own father (as Jeffrey suggests when he confronts her in the penultimate chapter). Her villainy resides in character more than it resides in the socio-economic structures from which her power derives. Though The Penderwicks has been hailed as a “timeless tale,” one might instead argue the book’s denial of history helps propagate the myth that, in America, class doesn’t matter. I push the ideological assumptions of each novel to the fore here, but I should also say that there is much to enjoy in each book — Birdsall’s gift for creating character (and humor! ), the silliness of Lowrey’s narrative. I don’t mean to suggest that either book lacks pleasures for a reader. Rather, in choosing two books that (I think) many people would posit as apolitical, I hope to make visible that which the texts leave implicit. How’s that? Hope it supplies the detail you seek. How about we teach our children critical thinking and not believing everything at face value? They might even come up with their own world view which even might be opposed to our own but I’d rather raise a thinking individual than a mindless drone. Let them read all the books with a leftist agenda. Then tell them if they want the whole picture they should read books from the right wing, too and some from somewhere in between. They should be exposed to opinions from all sides, not just from one.